PHOTO: G. Michael Graham. Highlands senior Jack Hegge brings the ball up-court in a recent game. The Highlands Bluebirds boys basketball team (14-9 overall) had a chance to set a new mark for most wins in a season since Head Coach Kevin Listerman took over in 2013 on the road Tuesday. They pulled away in the second half to do just that with a 72-42 victory over Cincinnati Anderson. Highlands finished 13-15 last year and last won 14 games in a season during the 2010-11 campaign going 14-16. Highlands led 31-28 at halftime. "We really played phenomenal team defense in the second half," Listerman said. "We made an adjustment and switched all the screens in their motion and flex (sets) and really caused their three-point shooters problems. We really didn't give them any good looks until late in the second half." PHOTO: G. Michael Graham. Highlands post Ben Sisson goes up for a shot against Newport Central Catholic on Tuesday. The win Tuesday was a nice win. But the Highlands Bluebirds boys basketball team (13-9 overall) quickly went back to work Wednesday preparing for an equally important 36th District game against the Bellevue Tigers (6-15) on Saturday. Highlands matched the most wins in a season since Kevin Listerman became head coach in 2013 with a sound 68-47 home win. The Bluebirds finished 13-15 last year. "We talked about that immediately following the game. We got into our regular routine," Listerman said. "The hardest thing is to maintain that level of focus and execution for an extended period of time and we talked about how important it is to strive for that. I felt for the most part we did a pretty good job (Saturday), especially on the offensive end. I thought we did a good job of moving the basketball and finding the open guy." PHOTO: Bob Jackson. Highlands senior Zoie Barth shoots a jumper in a recent game. The Highlands Bluebirds girls basketball team (20-4 overall) will be the undisputed top seed in the 36th District Tournament once again. Highlands has not lost a district seed game since the district went to that format before the 2013-14 season. The Bluebirds finished off seed play Friday with a convincing 67-25 win over the winless Newport Ladycats (0-19). Newport's first-year head coach is 2008 Highlands graduate Alex Adler. PHOTO: Bob Jackson. Highlands junior Rylee Thomas (22) goes up for a shot in a recent game. The Highlands Bluebirds girls basketball team (19-4 overall) once again overwhelmed a 36th District opponent extending the winning streak against district opponents to 27 straight. Highlands led the Bellevue Tigers (11-9), 29-11 after one quarter and 56-22 at halftime on its way to a 94-41 victory. That is the season-high in points and the most lopsided win of the season. Bellevue's head coach is Tommy Sorrell. PHOTO: Bob Jackson. Highlands junior Piper Macke fires a shot in a recent game. 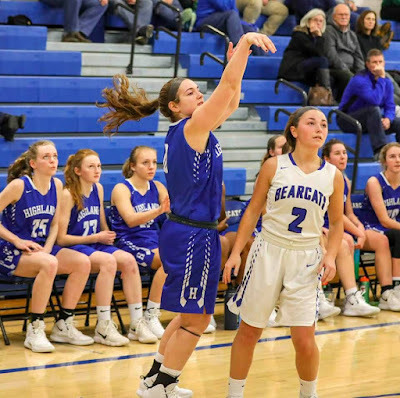 The Highlands Bluebirds girls basketball team (18-4 overall) pulled away from the rival Notre Dame Pandas (12-7) in the second half for a 59-33 9th Region road victory Monday. Highlands has won four in a row and Notre Dame has dropped four straight. The Bluebirds moved to 6-2 in region play and the Pandas fell to 4-4. 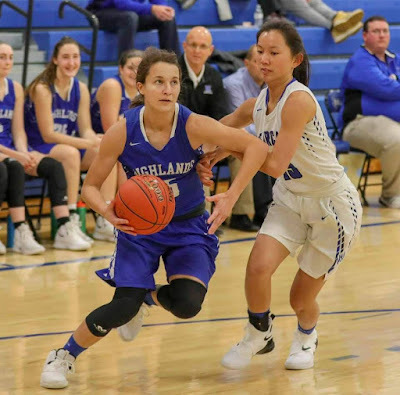 "In the second half, we started playing better defense and rebounded the ball on the defensive side," said Jaime Walz-Richey, Highlands Head Coach. "Notre Dame is a very scrappy team that goes after every loose ball and rebound." PHOTO: G. Michael Graham. The Highlands players prepare to take the floor in a recent game. 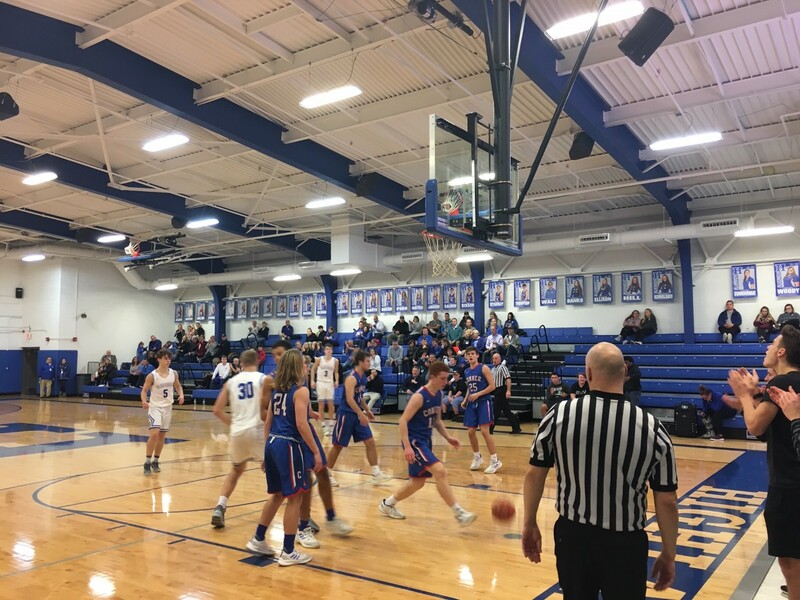 Not only did the Highlands Bluebirds boys basketball team (11-9 overall) end another long losing streak against a 9th Region opponent, the Blue and White left no doubt in Fort Thomas. Highlands led the 6-13 Dixie Heights Colonels, 42-24 at halftime and extended it to 63-32 entering the third quarter on its way to a 70-47 victory. Highlands snapped an eight-game losing streak against Dixie Heights dating back to Dec. 15, 2009 when the Bluebirds beat the Colonels, 48-39 in Fort Thomas. "We know as a team, we have a lot of potential," said Jack Delagrange, Highlands junior. "It gives us the motivation to step up and change what's been happening these last 10 years." PHOTO: Bob Jackson. Highlands freshman Anna Greenwell (left) drives to the bucket in a recent game. Greenwell scored nine points in the 79-47 win over Cooper on Thursday. After one quarter, the heavily-favored host Highlands Bluebirds girls basketball team (16-4 overall) led just 20-17 over the young Cooper Lady Jaguars (2-14). But the Bluebirds turned the intensity up in the next two quarters and pulled away for a 79-47 9th Region victory. Highlands moved to 5-2 against region opponents. The Bluebirds led 48-27 at halftime and 68-36 entering the fourth quarter. PHOTO: G. Michael Graham. Highlands senior Nate Roberts receives some last instructions before taking the in-bound play at Cooper on Monday. 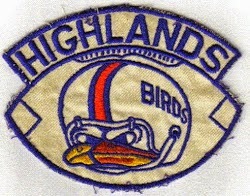 Roberts scored 10 points in the Highland loss. The Highlands Bluebirds boys basketball team (10-9 overall) broke one losing streak to a common 9th Region opponent Monday and hoped to break another one Tuesday. It did not happen. The Cooper Jaguars (15-3) penetrated better against the Highlands defense and came away with a 52-41 win. Cooper is 7-1 against region opponents while the Bluebirds dropped to 7-2. After breaking a 17-game losing streak at Covington Holmes on Monday, Highlands dropped its eighth straight against Cooper. The only win in school history for the Bluebirds against the Jaguars came on Dec. 11, 2008 in an 85-49 win in Union during the first year Cooper opened up. PHOTO: Bob Jackson. Highlands freshman CC Shick (25) goes up for a shot against Walton-Verona's Paige Heuser (3) in Monday's game. Highlands won 77-49. 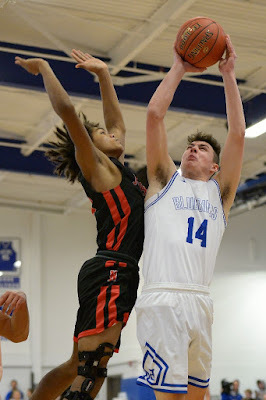 The Highlands Bluebirds boys basketball team (10-8 overall) may have faced a struggling Covington Holmes Bulldogs team (4-14) on the road in 9th Region play Monday. But it was still a huge 65-55 region win for the Bluebirds, who moved to 7-1 in region play. Highlands snapped a 17-game losing streak against the Bulldogs dating back nearly 16 years to a 76-63 win in Covington on Jan. 23, 2003. That included losses in the 9th Region quarterfinals in 2005 and 2014. "(The Bulldogs) are a very dangerous team," said Kevin Listerman, Highlands Head Coach. "They've got some guys that can attack pretty hard off the bounce. They have some nice athletes and if they shoot the three well on a given night, they have a chance to beat you and we did a very good defensively all the way around." PHOTO: G. Michael Graham. Highlands senior Ashley Hayes (2) gets down on defense in a recent game. 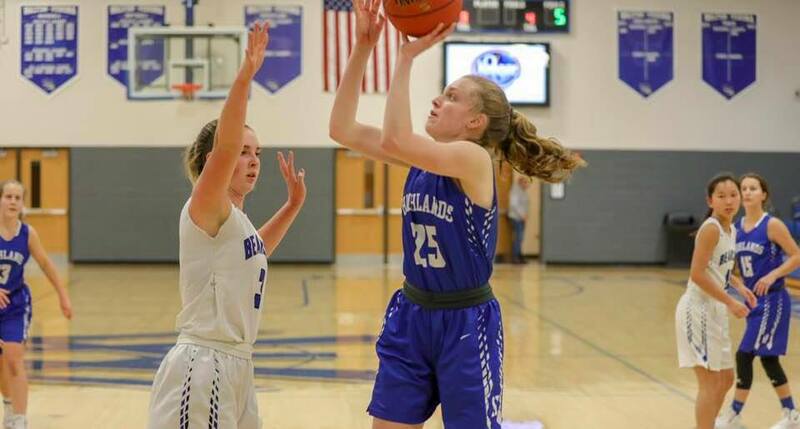 The Highlands Bluebirds basketball team (14-4 overall) lost its second game in two days on the road in Louisville, 47-39 against the host Butler Bearettes (11-5) on Saturday. This marked the second meeting between the two teams this season. Highlands beat Butler, 43-30 in the Traditional Bank Holiday Classic at Lexington Catholic on Dec. 22. PHOTO: G. Michael Graham. Highlands junior Maggie Hinegardner (13) looks to make a pass as Rory O'Hara (35) runs up-court in a recent game. 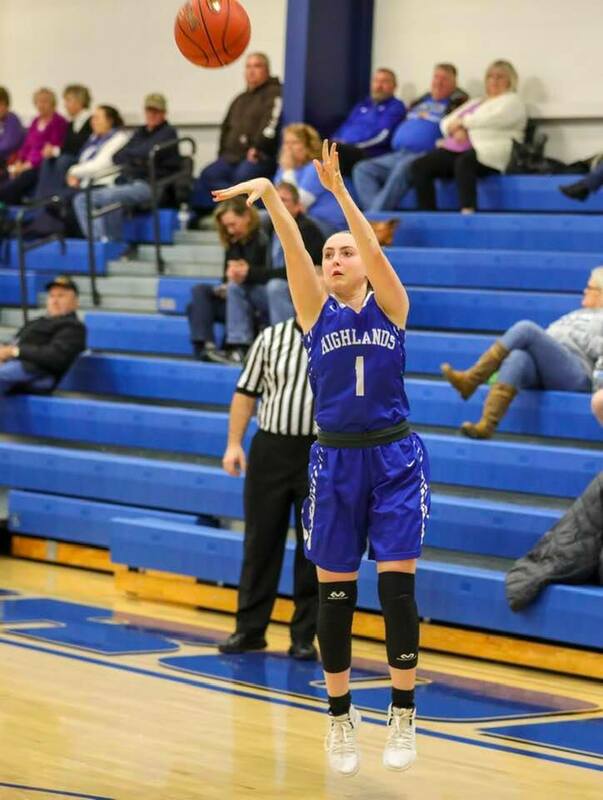 The Highlands Bluebirds girls basketball team (14-3 overall) built a 28-10 halftime lead then held on for a 47-43 victory over the Assumption Rockets (9-8) on Friday in Louisville. The Highlands Bluebirds boys basketball team (9-8 overall) suffered a huge 81-52 loss to the host Campbell County Camels (13-3) on Thursday. The Camels have won five in a row in the series. They won the 37th District and 10th Region championships last year before losing 56-55 to Oldham County in the state quarterfinals last year. Highlands last beat Campbell County, 56-52 in Fort Thomas on Jan. 17, 2013. Highlands travels to Covington Holmes (4-12) on Monday. Game time is 7:30 p.m.
PHOTO: G. Michael Graham. Highlands junior Piper Macke (1) makes a pass in a recent game. Macke scored 14 points in the 62-26 win over Bishop Brossart on Wednesday. This series has been lopsided lately in favor of the Blue and White. The Highlands Bluebirds basketball team (13-3 overall) won its sixth straight over the county rival Bishop Brossart Lady Mustangs (12-5), 62-26 in Fort Thomas on Wednesday. Highlands has won the last five meetings by an average of 35.6 points. PHOTO: G. Michael Graham. Highlands junior Jacob Brass (5) and Jack Hegge (3) get in defensive position after a Ben Sisson score against Conner on Tuesday. The contested shot hit the rim and bounced off. That turned into a sigh of relief for the Highlands Bluebirds basketball team (9-7 overall) as the four-game losing streak came to an end in a 51-50 9th Region victory over the Conner Cougars (6-8). Highlands is 6-1 in region play with the win. "We talked to our guys at halftime about making really good choices," said Kevin Listerman, Highlands Head Coach. "We did a much better job of taking care of the basketball. That kept us relaxed. I thought our defense, especially on the last possession, was unbelievable. They had to take a difficult shot. We guarded two different actions in their sets. Fortunately, the ball bounced our way. We talked to our guys about finishing games and it's good to finish one and put one in the win column." PHOTO: G. Michael Graham, Fort Thomas Matters. Alumni Highlands girls basketball players pose with current players on Friday. Early in the game, Highlands Bluebirds senior guard Zoie Barth penetrated the paint and guided the ball off the square in the back of the glass soundly for the high-percentage lay-up. 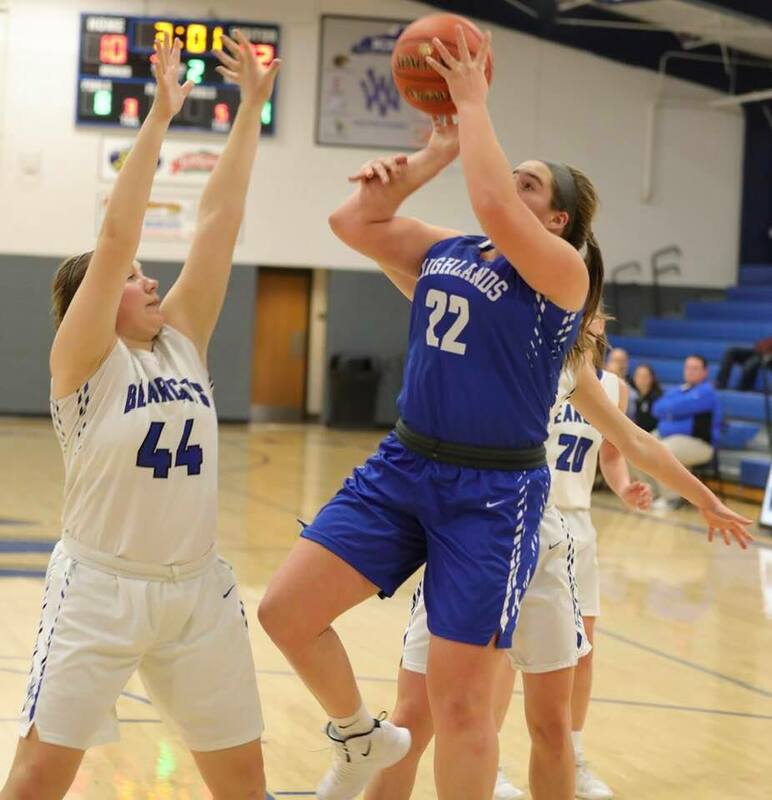 Before you knew it, the Bluebirds (12-3 overall) quickly built a double-digit lead on the visiting Newport Central Catholic Thoroughbreds (8-5) in a crucial 36th District girls basketball game. Things continued to come together for the Bluebirds as the cruised to a 71-46 victory in Fort Thomas on Friday. "We pressed some trying to get more opportunities on offense," said Jaime Walz-Richey, Highlands Head Coach. "We did some good things, but film shows us some things we have to work on. We'll watch film and see how we can get better." PHOTO: Dale Dawn. Highlands senior Grady Cramer puts up a shot in a recent game. The last day of the Hilton Sandestin Beach Blowout at Freeport High (Florida) did not go well for the Highlands Bluebirds basketball team. Highlands (8-5 overall) lost to the Knox Central Panthers (11-2) by a 66-53 score in the third place game. The Bluebirds made the semifinals of the winners bracket with wins over two Alabama squads before losing to Lexington (South Carolina) in the semifinals.